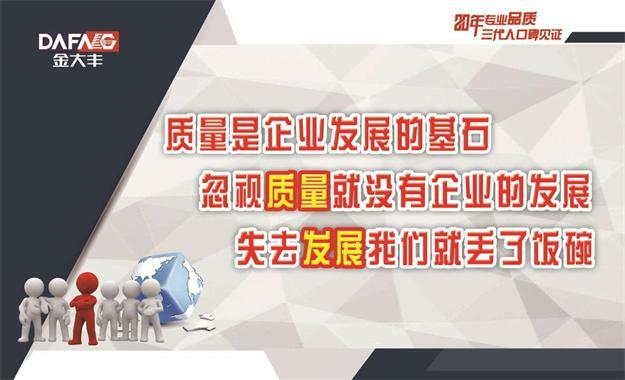 Xu Xiangqian told reporters that the company is located in medium-sized enterprises, with large enterprises than the price and speed of response, with small businesses than the quality and service. Very rare is that in the inventory become the industry's normalization "landscape" on the occasion of the basic realization of the inventory of gold Dafeng, which not only to the cash flow of enterprises, reducing the physical and mental pressure on the business, but also reduces the upstream Supplier fund occupation. Gold Dafeng will be 2018 as quality improvement year, rely on the quality to win the market, the specific approach is in t he people, machine,The power behind the contrarian growth material, law, the ring affirmed Aoyama do not relax. Gao Zhaoyou from Jingao Village, Luyi Town, Boxing County, Shandong Province is a loyal user of Jin Dafeng. At the 2018 Annual Business Conference held on December 14 in Gold Dafeng, he said proudly that the operation of the Gold Dafeng corn can be slow and fast, no matter whether it is small plots of land or rain and wet. This year, many brands in the local market can not work , Gold Dafeng will be able to put through the work done, a telephone service, service personnel came. This year Gaozhao You after two and a half months, homework more than 600 hours, 4500 acres of corn harvest, down a job quarter earned 100000 dollars. In his words, "Jinfeng Dafeng brought me great income, very satisfied." 2017 is undoubtedly the proud year of Shandong Gold Dafeng Machinery Co., Ltd. In Gold Dafeng, despite the market entering a period of deep adjustment, the company, with its new brand and new face, entered the market for the fourth year produced and sold nearly 4,000 harvesters of all kinds and achieved a sales revenue of 430 million yuan and an annual sales increase of 40% Industry companies are one of the few well-known corporate growth. Very rare is that in the inventory become the industry's normalization "landscape" on the occasion of the basic realization of the inventory of gold Dafeng, which not only to the cash flow of enterprises, reducing the physical and mental pressure on the business, but also reduces the upstream Supplier fund occupation, in the next few days held supplier annual meeting, the move of Jin Dafeng said for many partners. According to Gao Yuan'en, honorary president of China Agricultural Machinery Industry Association, this year the country's agricultural machinery industry is in a difficult time. Jin Dafeng contrarian growth, surpassing the average growth rate of the entire industry during the golden age. "I think this year is a miracle." As one of the two major sub-industries in the agricultural machinery industry, sales of combine harvesters dropped 25.57% YoY in the first 10 months of the previous year, while corn harvesters fell more than the previous year. There are only a few enterprises with more than 1,000 key enterprises producing more than 1,000 this year. Close the door, and a large number of layoffs in some enterprises. On the contrary, Jin Dafeng has realized the output, benefits and brand share of "three increases", it is worth praising. 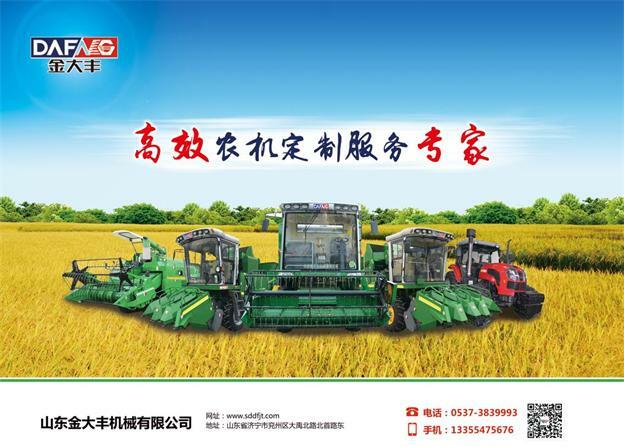 Right now China's agricultural machinery industry, the most lacking is undoubtedly good quality. On December 14, the 2018 Annual Business Meeting held by Kim Dae-Fung will highlight the company's emphasis on quality and quality with the aim of "creating a fine product by heart, creating a win-win future together." Jin Dafeng will be 2018 as quality improvement year, rely on the quality of the market, the specific approach is in the people, machine, material, law, the Central affirmed Castle Peak is not relaxed. Some people think that the leadership of Shandong Jin Dafeng can be described as a grasp of the pain of the development of the industry. To accomplish the above objectives and planning, Xu Xiangqian arranged the following five aspects. Firstly, on the aspect of human resources, we should raise the awareness of all staff members and create their own abilities, strengthen the education and training of employees, and require the managers of Jin Dafeng to be good at four kinds of people: one is a good teacher, the second is a good example, the third is a good parent, Four is a good judge. The company collects a wide range of proposals for the rationalization of each employee and transforms into practical actions for business operation. Once the economic benefits have been achieved, Jin Dafeng encourages and rewards. Every month, the company conducts technical training for its staff, conducts a technical contest every quarter, makes quality cases in the same year, analyzes improvement and improvement, passes appraisal and evaluation, links with wages, allocates positions according to scores, so as to truly improve product core competitiveness . Second, continue to increase investment in technology, production technology and equipment reform. It is understood that in the four links in the manufacturing, Jin Dafeng already has the intelligence of the blanking, 2018 and plans to invest 50 million yuan to transform the welding automation, improve welding quality and efficiency. Since 2012, through two phases of construction, Jin Dafeng has built a 36,000 square meters modern production workshop equipped with modern machinery and equipment such as CNC laser equipment, welding robot, automatic Kaiping line, electrophoretic paint line and flexible assembly line to further enhance the process of assembly Level. In addition, Jin Dafeng has a professional process engineer composed of the Department of Technology, for each process of each product, have conducted a standard professional process preparation, to ensure the stability of product quality Dafeng. Third, from the source of supply to live quality control. Jinfeng Dafeng adhere to the three requirements of the dynamic management of suppliers, the organization of technical quality supply staff to participate in the assessment team to the supplier for on-site examination and assessment, assessment, to determine the qualification of supply, the other harvested mechanical core components gearboxes, electrical appliances , Auger and other self-made, technicians are hired from well-known domestic enterprises. Fourth, in the production environment, the first two years of gold Dafeng hired 5S management experts from Japan, training and guidance in the company for one year, so that employees have realized the quality of consciousness has greatly improved, to lay a good product quality The most solid foundation. However, in the face of the rapid growth of the company, Xu Xiangqian, an accomplished family member of the Kim Dae-jung, remains awake. In his opinion, in the face of the harsh market situation, Jin Dafu is still on the trail. Next, the company should continue to enhance all-round innovation and solve problems in development with innovation. In particular, it is necessary to ensure an innovative environment for institutional talents, opportunities for entrepreneurship platforms and officers, adhere to the principle of people-oriented, innovation-driven and enterprises Sustained and healthy development. The main performance improvement from the user's approval of the product. Another from Liu Erhua in Fuyang, Anhui Province in June this year, bought a gold Dafeng wheat harvesters. According to her introduction, the product is very fast in use, threshing clean, user highly recognized, the service is in place, the service has always been around. In the harvest of wheat, the same piece of other brands, a bit in the field statistics, Jinfafeng three back and forth, the other two back and forth, operating efficiency. Through the use of the brand, Dafeng has increased its goodwill. In the second half of this year, Liu Erhua purchased a three-row corn machine and a 1304 tractor, which were used very well and earned more money. Liaocheng, Dongcheng, Liaocheng, Shandong, the dealer Du Feng from Xu Fengqian Daxian entrepreneurship began to start business, from the King of Dafeng to Dafeng, has been cooperation for more than 20 years. He said that since its entering a new face in 2014, Jin Dafeng has enjoyed year-on-year growth after entering Liaocheng market. In 2017, it is the year when Jin Dafeng introduced the most new products, demonstrating its research and development strength over the past 20 years. The company's products have good performance and high cost performance , Technology upgrades fast, adapt to the market faster, faster service response. In sales, Gold Dafeng strong support for the dealer, so that dealers have no worries in the development of the market, the face of the common market, serving a common user, to achieve rapid success. "Facts have proved that Jinfeng products dealers reassured, users have peace of mind, the longer the more cooperation Jinfeng heart more practical." Second, continue to increase investment in technology, production technology and equipment reform. It is understood that in the four links in the manufacturing, Gold Dafeng already has the intelligence of the blanking, 2018 and plans to invest 50 million yuan to transform the welding automation, improve welding quality and efficiency. Since 2012, through two phases of construction, Jin Dafeng has built a 36,000 square meters modern production workshop equipped with modern machinery and equipment such as CNC laser equipment, welding robot, automatic Kaiping line, electrophoretic paint line and flexible assembly line to further enhance the process of assembly Level. In addition, Jin Dafeng has a professional process engineer composed of the Department of Technology, for each process of each product, have conducted a standard professional process preparation, to ensure the stability of product quality Dafeng.